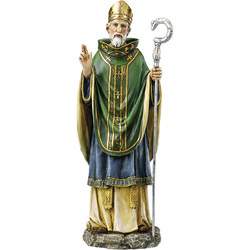 Our patron saint is St Patrick. St Patrick’s feast day is celebrated on 17th March. He is known as the “Apostle of Ireland” and used a Shamrock to explain the Trinity. Patrick was a humble, pious, gentle man, whose love and total devotion to and trust in God should be a shining example to each of us. He feared nothing, not even death, so complete was his trust in God, and of the importance of his mission.